Bristol Ridge or Stoney Ridge, respectively, is the code name for the 7th generation of A-series APUs and the successor to the Carrizo and Carrizo-L APUs. Even though nothing changed in terms of transistors, there is significant progress thanks to numerous activated features, optimizations as well as an adjusted manufacturing process. Bristol Ridge and Stoney Ridge were announced during Computex on June 1, 2016 and are already shipped in the A-series APUs starting in June. Bristol Ridge is the designation for the more powerful and expensive APUs and direct successor to Carrizo. They are manufactured in a quad-core die (2 modules) with 250.4 mm² and 3.1 billion transistors. Stoney Ridge is the designation for the smaller and cheaper entry-level APUs and is the successor to Carrizo-L, which is based on a completely different architecture compared to Carrizo (e. g. even more frugal Puma cores instead of Excavator). It uses a dual-core die (1 module) with 124.5 mm² and 1.2 billion transistors. One new feature is the DDR4 (LP) support of the 128-bit memory controller, which was reserved for some embedded processors so far and not activated for Carrizo. More details about Carrizo, the similar Excavator CPU cores and the GCN GPU cores are available in our Carrizo launch article. Bristol Ridge is still manufactured in a 28 nm process at Global Foundries, but the recipe was improved. 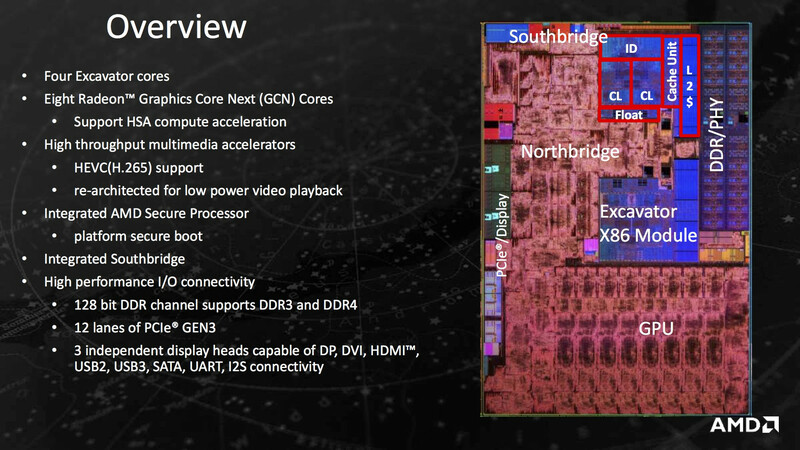 This means AMD did not have to redesign the whole chip and was able to use existing templates. Still, there are noticeable improvements: Bristol Ridge can now use higher clocks at the same consumption (or the other way around, respectively). The picture on the right illustrates the improvements from Carrizo (red) to Bristol Ridge (green). The mobile APUs consumption of between 15-35 Watts is usually in the area of 1/2-2/3 of the curve (roughly). Bristol Ridge's efficiency increases of about 50% are supposed to be a result of the improved process. 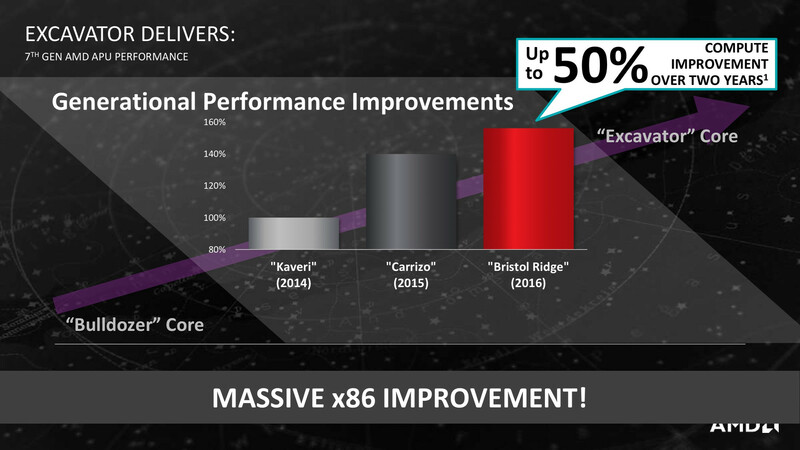 AMD advertises the following four new features for Bristol Ridge and Stoney Ridge, respectively, compared to Carrizo. 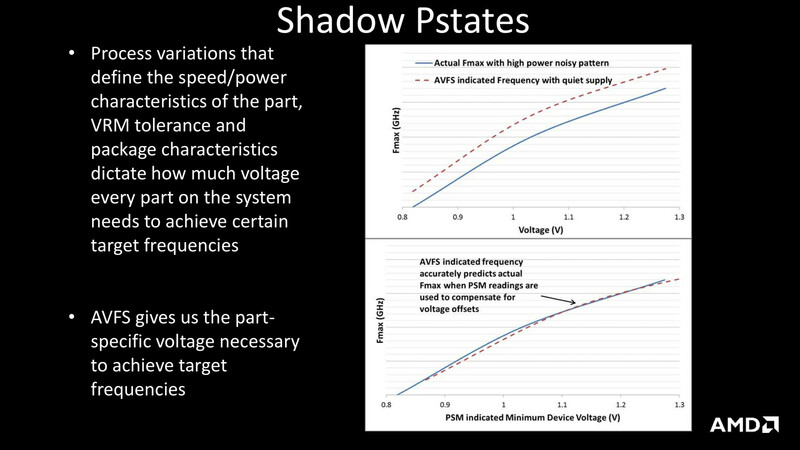 In addition to the 8 different Power States the operating system can use to control the APU, there are now two so-called Shadow P-States. Thanks to measurement electronics and 500 sensors inside the silicone, these two P-States allow for a more precise control. 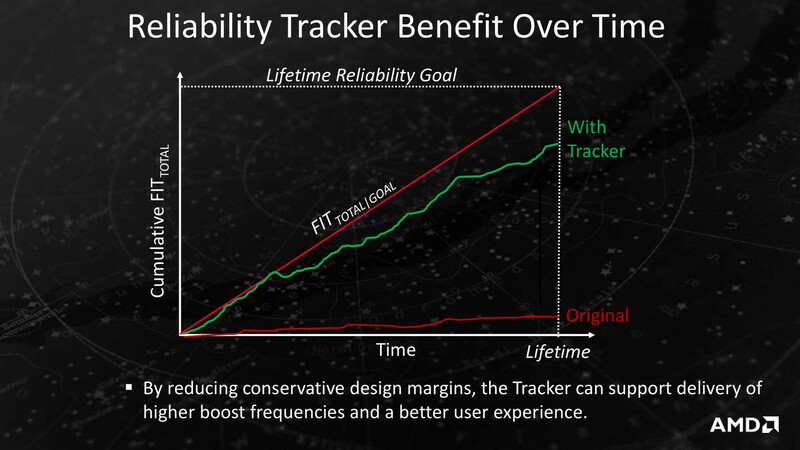 Thanks to an improved prognosis for long-term reliability, AMD can use much higher Boost clocks. 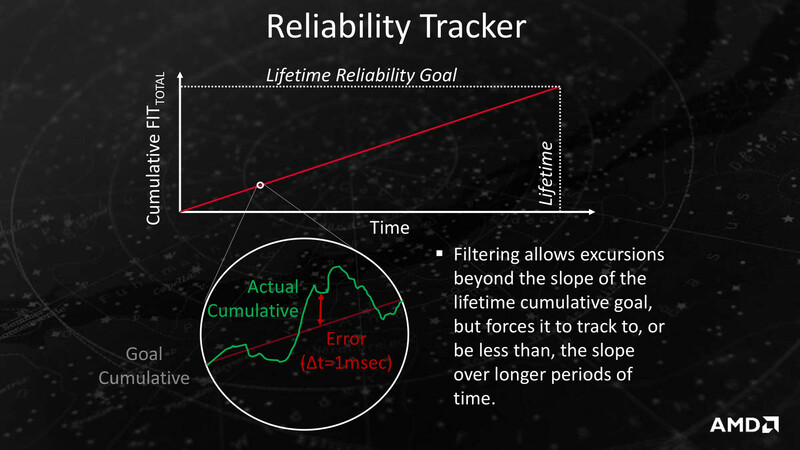 This means the APU can run closer to the limit of its environment without jeopardizing the long-term reliability of the chip. This feature accounts for up to 12% of the performance gains according to AMD, because they do not have to rely on conservative estimates. This feature is only available when the notebook manufacturer configures the device together with AMD. It requires sensors underneath the palm rest and at the bottom of the notebook, for instance. In combination with corresponding calculations about heat distribution inside the notebook, the Boost duration can be increased compared to internal sensors from the processor. This should result in noticeably higher performance for short workloads (web browsing, office, etc.) in particular. 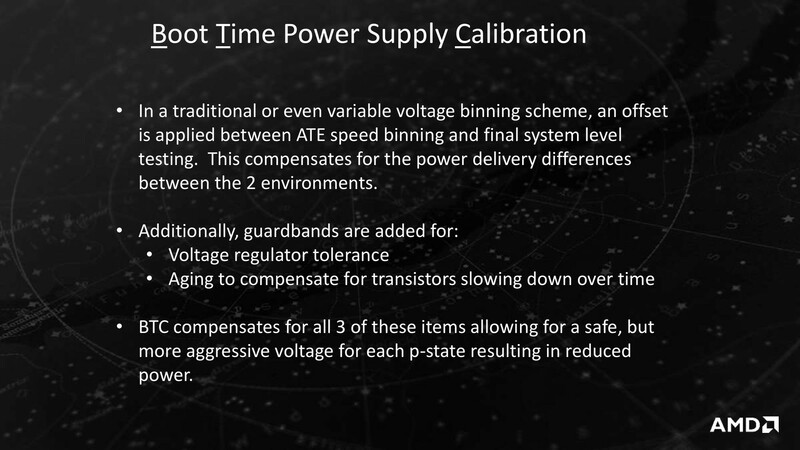 The selection process for processors usually includes the tolerances of voltage regulators and the aging of transistors over the lifetime. Because of this and the differences during binning (selection of processors) and the final notebook, the clocks can only be chosen conservatively. 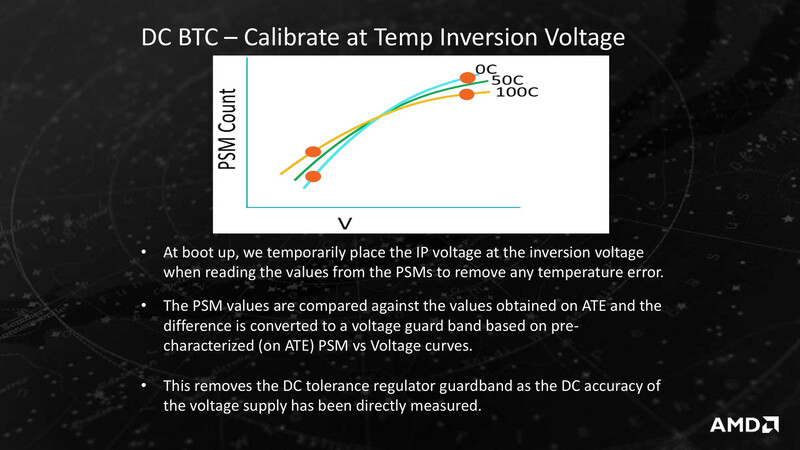 With the BTC technology, the voltage is measured every time the device boots up and the results are compared with the initial boot sequence. 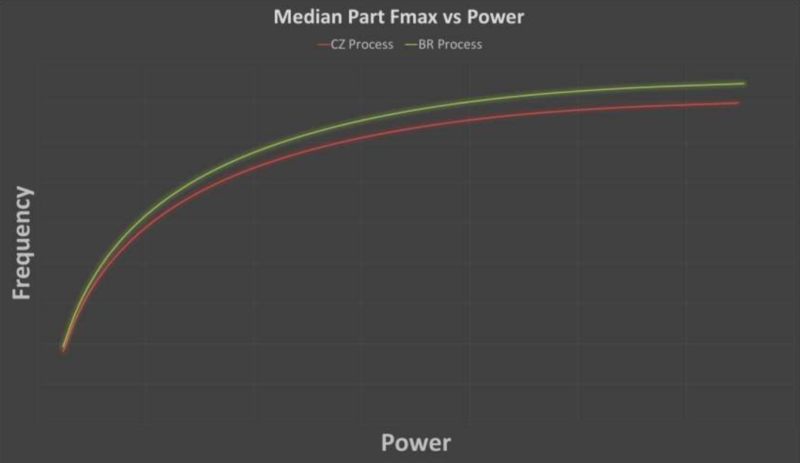 This means you can compensate for tolerances and aging processes and select more aggressive voltages. ...higher Boost frequencies thanks to a less conservative design. Sensors for the surface temperatures of the devices can allow longer Boost periods. Each notebook therefore has to get its own model and sensors. 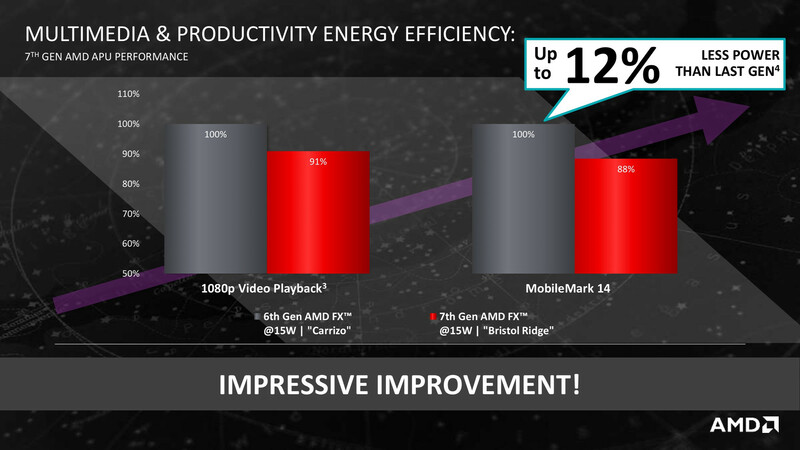 Thanks to the previously mentioned methods, AMD partially manages significant performance and efficiency improvements depending on the TDP category compared to Carrizo. 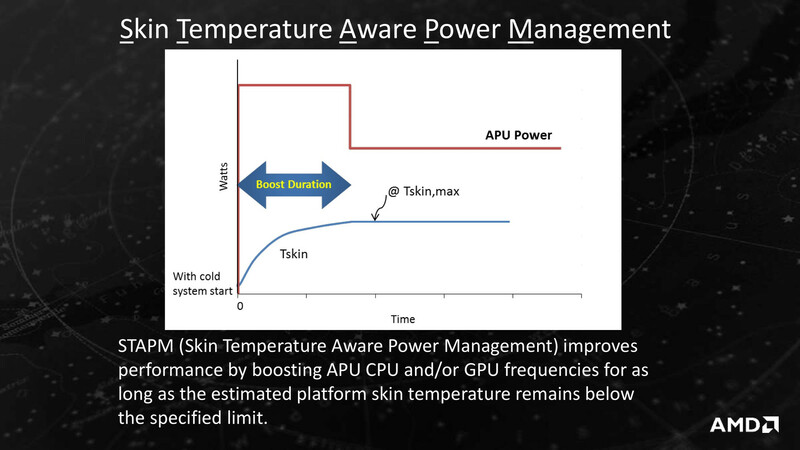 Depending on the model, the Boost clocks for the CPU and GPU should be maintained for longer periods. Another factor is the higher specified clocks for many models with the same TDP range. Because of this, the performance of all models should be higher. The IPS performances of the processor and graphics cores on the other hand did not change. Improved power efficiency in the 15-Watt range. Slightly increased processor performance thanks to longer Boost periods and higher clocks. 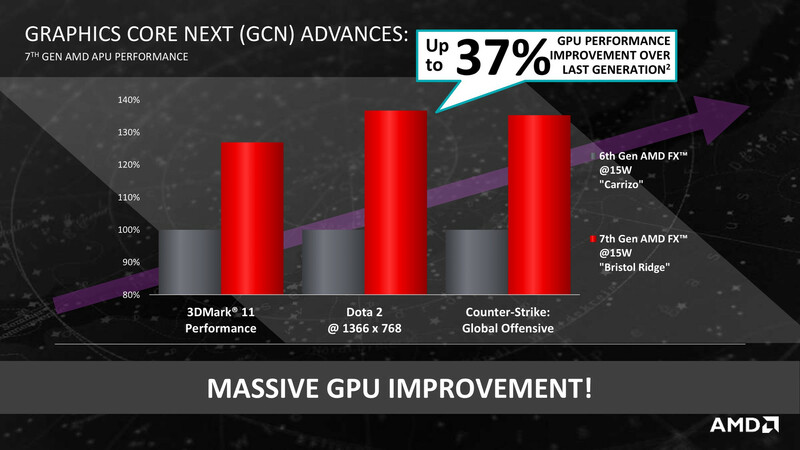 Significantly higher GPU performance thanks to longer Boost periods and higher clocks. 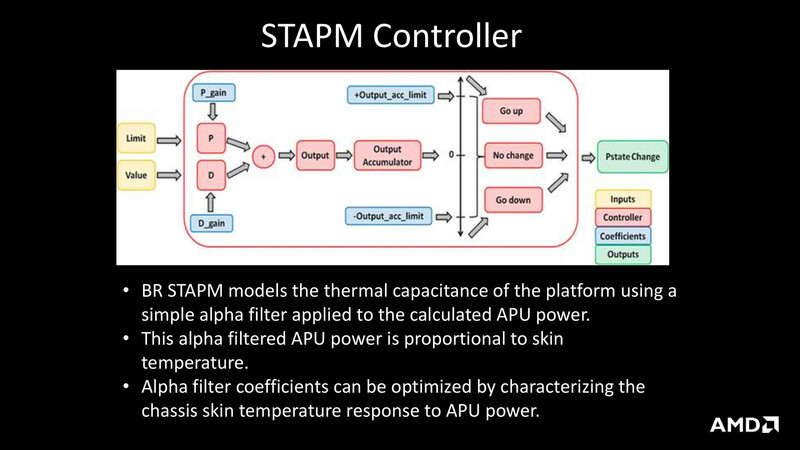 Thanks to 9 more months of validating and testing (in addition to the 12 months for Carrizo), AMD was able to activate additional features in the silicone and therefore improve the efficiency. 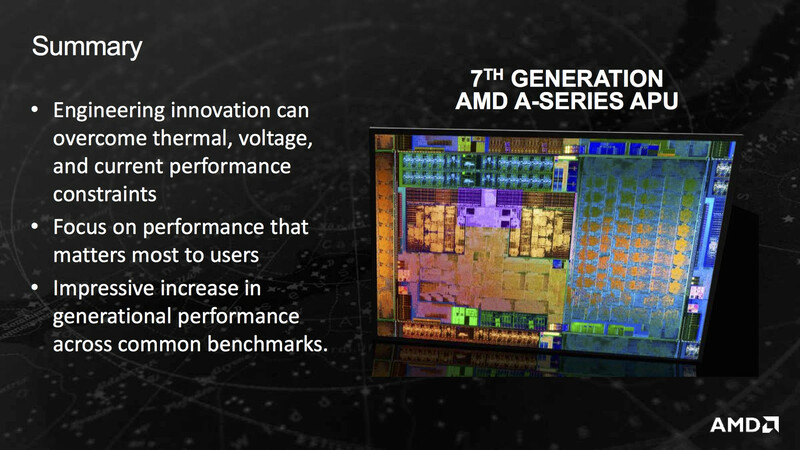 The manufacturer also switched to an improved 28 nm process, which brings additional performance gains. This two-stage launch of Carrizo and Bristol Ridge was planned from the beginning according to AMD. These improvements also result in the discontinued Carrizo-L, which is replaced by a one-module die (dual-core) from the Bristol Ridge architecture called Stoney Ridge. Ryzen is great — so why are most AMD notebooks embarrassingly bad? With either an NVIDIA GeForce GTX 1050 Ti or an AMD RX 550, Acer's new mainstream gaming notebook offers quite a few options. Bristol Ridge business.HP's 12.5-inch EliteBook is powered by an AMD APU. 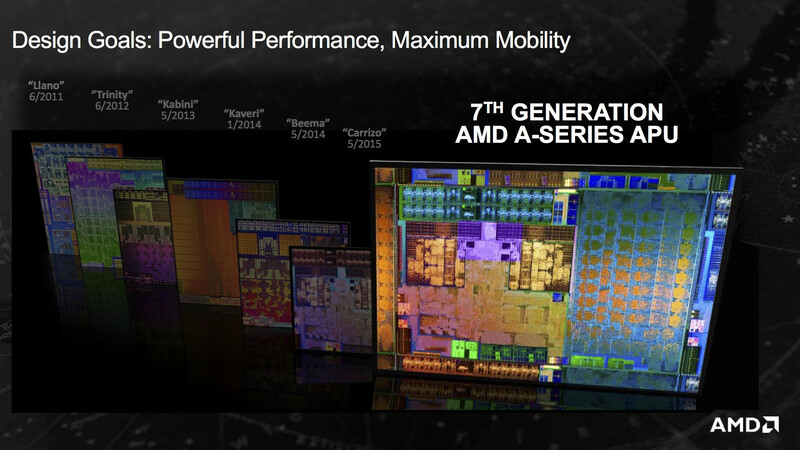 Thus, HP is one of the few manufacturers that still use AMD's APUs in the business sector. The APU is supported by an IPS panel, NVMe SSD, and LTE modem. Unfortunately, the laptop fan emits a subtle whistling sound. AMD office. HP's 17.3-inch device is made for users who are looking for a simple 17.3-inch notebook for home use. Accordingly, the computer comes with plenty of storage space (1 TB) and a more than sufficient amount of RAM (8 GB; dual-channel mode). However, these are all of the laptop's highlights. The list of shortcomings is more extensive. Lenovo and AMD have introduced the first ThinkPads with AMD Bristol Bride Pro platform, which is supposed to rivals Intels vPro CPUs. The new models E475 and E575 are going to be available starting in early November. AMD A10-9600P | AMD Radeon R5 (Bristol Ridge) | 15.6"